Olympia Time: Where would have the Northern Pacific met Budd Inlet? Where would have the Northern Pacific met Budd Inlet? The Puget Sound Land Company, a subsidiary of the Northern Pacific and bought up large tracts of land on Budd's Inlet in the name of one Ira Bradley Thomas. Before the rails reached Olympia, Thomas died. Rather than face the legal delays of probating his estate, the company quickly bought up new land near Old Tacoma and told the Northern Pacific to change its terminus to that location. 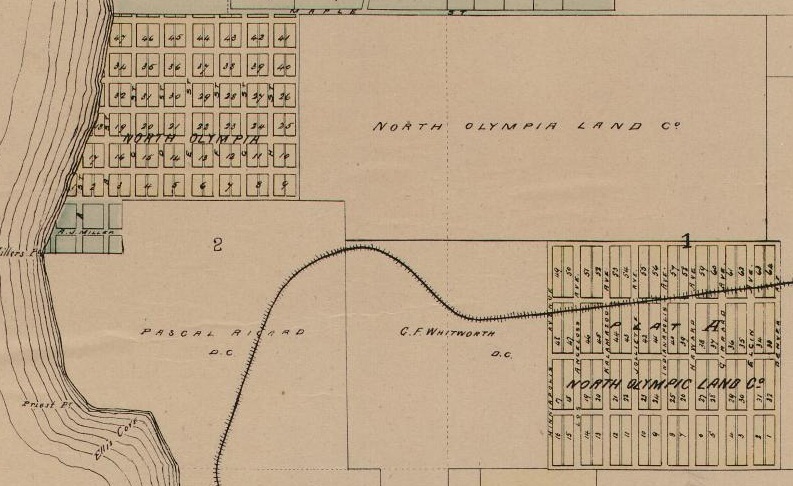 Had an obscure business man, Ira Thomas, lived just a little longer, Olympia would undoubtedly have become the western terminus of the first northern transcontinental railway and the site of the present city of Tacoma might still be a comparative wilderness. Can you imagine how Olympia could have ended up differently had we, and not Tacoma, ended up the first industrial metropolis on the sound? I can imagine deepwater dredging all the way to Tumwater and down Swantown Slough. Possibly fill all the way out to Priest Point. Certainly a larger and more developed city. But, the exact extent of our growth would've been determined by exactly where on Budd Inlet the terminus was meant for. I think I've come up with a general location of where the Pacific Northern Railroad would've met the Puget Sound had they chosen Olympia. 1. First, I wanted to find out if Ira B. Thomas really did come to Olympia in the 1870s to buy land for the Northern Pacific. It wasn't uncommon for land purchases to be made in the name of the Northern Pacific back then. But, what sometimes seem too good to be true and fanciful stories that get repeated in local history, just really are too good to be true. That doesn't seem to be the case for Ira Thomas, though. According to at least this federal case, his estate was still being fought over 20 years later. Since probating the case took over 20 years, the Northern Pacific was pretty smart to move onto Tacoma. 2. So, Ira Thomas was in Olympia and he did buy land for a railroad terminus, where was that terminus? Apparently, the name North Olympia Land Company can still be found in some legal descriptions of property around here. At least this real estate database (BackPlant Tract Book by Titlepoint) lists the company as a search parameter for Thurston County. 3. 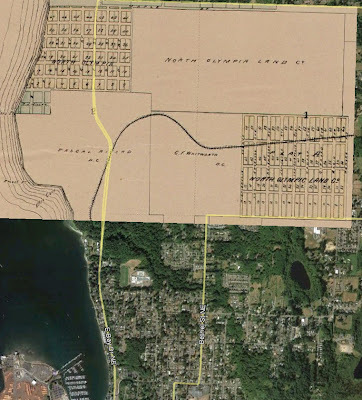 So, where are the lots with North Olympia in their legal description on Budd Inlet? From what I can find plugging around on Thurston County's Geodata, right here. 4. So, finally, what does this tell us? Maybe nothing, it is possible that Ira Thomas' mission in Olympia was just a ruse. Possibly like other land buys in King County, Thomas might've been trying to divert attention from the mostly empty property along Commencement Bay. Compared to Olympia with 1,200 people, only 200 lived in Tacoma. The Northern Pacific possibly wanted all the land riches for themselves. Or, maybe, Thomas' death really did put the dream of Olympia as major west coast city or at least major western Washington to bed. Maybe in addition to being the state capitol, we would've had a mighty metropolis to go along with it. I like to imagine what could've been. 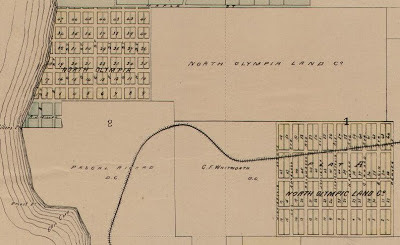 Update (11/21/12): Just realized that this map (which I've looked at dozens of times) gives a pretty great idea of where the Olympia Land Company property was.